If you want a stock pot with exceptional performance and superior quality, you'll find it in the All-Clad Copper Core 8-quart stock pot. 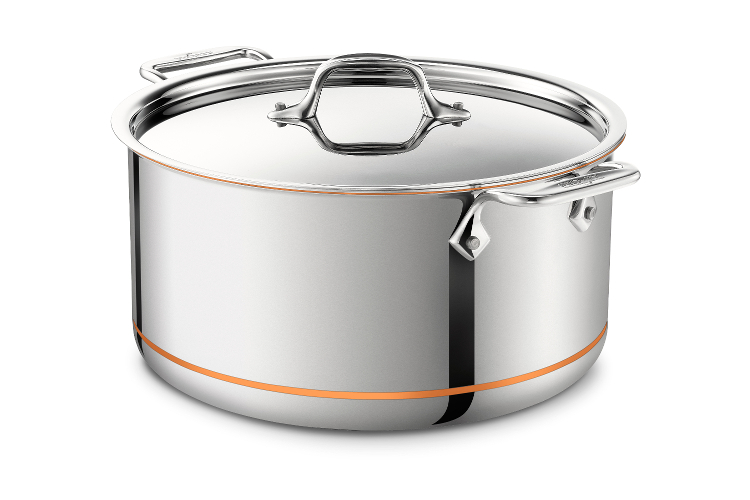 Complete with lid, the pot has a 5-ply design that incorporates a non-reactive 18/10 stainless interior. Its copper core is coated with aluminum, which provides rapid and even heating and cooling so you can be in complete control of temperature. It's ideal for cooking on a traditional stove or with induction. All-Clad cookware is highly prized for its extraordinary performance and quality. Copper Core is the result of many fine elements coming together. At the heart of Copper Core are 2 layers of aluminum with a generous layer of copper in-between. The aluminum provides even heating and the copper speeds up the process of heating and cooling allowing chefs and home cooks alike to control temperature like never before! The exterior features a highly polished magnetic stainless steel and a band of copper for a dramatic, elegant appearance. The luminous magnetic steel ensures Copper Core will work on every cooktop including induction! All-Clad is the standard by which all cookware is measured and Copper Core marks the epitome of all things All-Clad! In Copper Core ergonomics, aesthetics and performance come together to the delight of the culinary world!